Dance Classes, Lessons, Events & Courses for Waggoners Square Dance Club. We are a dance club which meets weekly to enjoy the pleasure of Square Dancing to Western music and the calls of Simon and Trudy and our other club callers. We run a beginners section that dance at their own level to the calling of Eric Curtis as they learn the mainstream programme. In addition to the weekly dance programme the club also promotes two Saturday night dances each year, featuring a guest caller and inviting the participation of dancers from other clubs. Event Organiser, Regular Dance Classes. 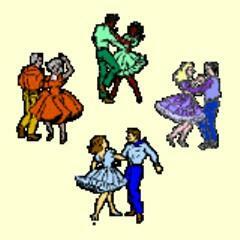 Dance Styles: Square Dance. Email: Waggoners Square Dance Club. All Entries for St Joseph's In The Park School Hall Venue. Car Parking. Square Instruction, Practice, Social Dancing. See website for closure dates.